Community Christmas Dinner Tomorrow Night! Our annual Christmas dinner is tomorrow at 6 PM. We will provide the meat but we ask that you bring a couple large side items. This dinner is for our BCC body and will be a great time to invite your friends and neighbors. Ladies Christmas Tea this Saturday, December 14th! Ladies, you are invited to a Christmas Tea and Ornament Exchange this Saturday from 9 to 11:30 AM. Join us for hot tea, refreshments, door prizes, music, and fellowship. Karen Phillips will be selling tickets tomorrow evening at the community dinner. This month we are talking about Hope for Christmas. Pick up your "Gift of Hope" at the table in the rear of the worship center for 10 dollars. The "Gift of Hope" box contains a Bible, Hope DVD with a message from Billy Graham, and a card with words of hope. This is a great way to introduce Christ to someone. Bereavement Worship on Christmas Eve! The bereavement worship will be on Christmas Eve, December 24th, at 4:30 in the blue room. While this is one of the seasons that brings us much joy, it can also be a time that is very difficult for those who have lost loved ones. The purpose of this worship is to present the hope we have in the Lord during some of the most difficult times of our lives. The Christmas Eve Worship will begin at 6:00 pm in the worship center on December 24th. You won't want to miss this exciting evening. 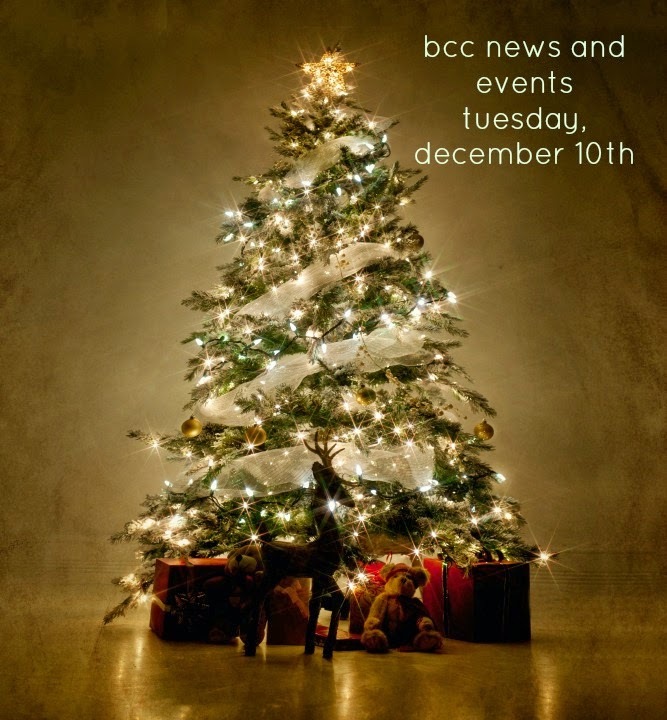 The kids will share a few songs with BCC and the evening will end with candlelight. Kids' Christmas Eve At BCC! If your child is in the minnows class through 5th grade, we would like to invite them to participate in the Christmas Eve worship by sharing a few songs with all of BCC! Practice for these songs will primarily be on Wed. nights. Mandatory rehearsals will also be on Sunday afternoon, Dec. 22nd at 2:00 and Tuesday, the 24th at 4:00 pm. Please sign up in the welcome center ASAP. The kids need to wear clothing with Christmas colors for Christmas Eve. If you need a CD with the songs or have questions, please contact Chris or Tracy. Missions and Lottie Moon Offering! The BCC body has cheerfully given $1,430.63 to the Lottie Moon and has given $18,419.19 to the Missions Offering. Throughout this month, we will still be taking donations to the Lottie Moon and Missions Offering. M.A. and Chelsea Dozier will be leading a team of four to six people from July 24th to August 3rd, 2014 to Camp Langano, Ethiopia. They will be sharing the gospel through participation in activities and sports. The estimated cost is $3,400 per person. If you are interested or have questions contact Chelsea at soccershew@gmail.com.